Are you looking for a fun-to-drive and family-friendly crossover? Mazda will deliver on all counts. With the five-passenger Mazda CX-5 and the seven-passenger Mazda CX-9 sitting at the top of their respective classes, families on the go may be hard-pressed to find the right fit at Earnhardt Mazda Las Vegas. Find the Mazda crossover that is perfect for your next family adventure with this in-depth 2018 Mazda CX-5 vs 2018 Mazda CX-9 comparison. A world-class entry in the compact crossover segment, the 2018 Mazda CX-5 pairs economy and athleticism with an affordable price tag. Mazda CX-5 models are available in three trim levels – Sport, Touring and Grand Touring – that make room for five passengers. Larger families who need more passenger space will love what the seven-passenger 2018 Mazda CX-9 brings to the table in four trim levels – Sport, Touring, Grand Touring and Signature. Mazda crossovers all upgrade your drive with a standard MAZDA CONNECT™ infotainment system with a seven-inch touchscreen display and Bluetooth technology. What Are the Differences Between the Mazda CX-5 and Mazda CX-9? 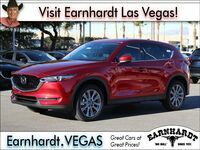 Price is a major factor in any car-buying decision and plays a vital role in this 2018 Mazda CX-5 vs 2018 Mazda CX-9 comparison at Earnhardt Mazda Las Vegas. Drivers who choose the Mazda CX-5 will enjoy an affordable price tag that starts at $24,150 with a smorgasbord of standard features. When you upgrade to the Mazda CX-9, you will enjoy more passenger space, more power and a larger platform with a budget-friendly price point that starts at $32,130. Under the hood, the 2018 Mazda CX-5 will employ a 187-horsepower SKYACTIV®-G 2.5 four-cylinder engine that features segment-first cylinder deactivation. When paired with the SKYACTIV®-Drive six-speed automatic transmission and cylinder deactivation technology, the front-wheel drive Mazda CX-5 will make 25 mpg in the city and 31 mpg on the highway. Equipped with all-wheel drive, the Mazda CX-5 will earn 24 mpg in the city and 30 mpg on the highway. An upgrade to the Mazda CX-9 promises an upgrade in performance fueled by a 250-horsepower turbocharged SKYACTIV®-G 2.5T four-cylinder engine that gets married to a SKYACTIV®-Drive six-speed automatic transmission. With this combination under the hood, the front-wheel drive Mazda CX-9 will achieve 22 mpg in the city and 28 mpg on the highway. Armed with all-wheel drive, the Mazda CX-9 will make 20 mpg in the city and 26 mpg on the highway. Passenger and cargo space are key elements of the crossover design that will benefit families on the go and Mazda-brand crossovers will fit the bill. Compact Mazda CX-5 models provide 30.9 cubic feet of cargo space behind the second row that will convert to 59.6 cubic feet with the rear seats laid flat. If you need more room, the Mazda CX-9 promises 135.1 cubic feet of passenger space and 14.4 cubic feet of cargo space behind the third row that will expand to 71.2 cubic feet with the seats laid flat – perfect for larger chores. Visit Earnhardt Mazda Las Vegas today to find the Mazda crossover that is the best fit for your lifestyle and budget!